THPBlog: Timber Products Company planning a pair of shelterwood THPs on steep and unstable slopes near the headwaters of Upper Trinity River. Timber Products Company planning a pair of shelterwood THPs on steep and unstable slopes near the headwaters of Upper Trinity River. Both of the THPs listed below are adjacent to each other and drain from the Picayume Creek Watershed into the Upper Trinity River and into Trinity Lake. These THPs will remove the over story from over 549 acres in an area that contains a large amount of granitic, ultramafic and serpentine soils which are more prone to erosion. THP 2-13-070 TRI (Slide Lake THP) Timber Products, 237 acres; 100% shelterwood logging. Picayume Creek (MD: T40N R6W Sec.29, 33). Wet weather operations, high erosion hazard, steep slopes up to 65%, landslide terrain, road failure sites, impaired 303.d watershed, 1 spotted owl within 1.3mi, Scott Mountain bedstraw, trees over 200 years old. Estimated public comment deadline: 11/16/13. This THP is about a dozen air miles SE of Callahan, CA between Highway 3 and the Mt Eddy area near the headwaters of Upper Trinity River at an elevation of 4,000 to 6,000 feet. Timber Products Company is planning a tractor and cable shelterwood logging operation in Jeffrey pine, ponderosa pine, Douglas fir, sugar pine, incense cedar, white fir, red fir and knobcone pine stands. The THP area drains from Picayume Creek towards Trinity Lake and contains some loose granitic, ultramafic and serpentine soils which are prone to erosion. There is landslide terrain related to a debris slide and a scarp in sections 29 and 33 caused by the 1997 storm. Timber Products wants to use a landing on steep slopes over 50% within 100 feet of a class II watercourse in section 29, and use tractors in unit 2 which Is designated as a cable logging unit for tail holds and for yarding logs. Road re-construction is proposed at 2 points on an unstable debris slide area. Two populations of Scott mountain bedstraw were found in section 29. This THP is just NE of Timber Products Company’s new (Little Trinity South Two) THP 2-13-073 TRI. THP 2-13-073 TRI (Little Trinity South Two THP) Timber Products, 312 acres; 100% shelterwood logging. Little Trinity River, Picayume Creek, Sherer Creek (MD: T39N R7W Sec.1, 11; T40N R6W Sec.31). Wet weather operations, high erosion hazard, steep slopes up to 65%, landslide terrain, road failure site, impaired 303.d watershed, 1 spotted owl within 1.3mi, trees up to 150 years old. Estimated public comment deadline: 11/18/13. This THP is about 10 air miles SE of Callahan, CA between Highway 3 and the Mt Eddy area near the headwaters of Upper Trinity River at an elevation of 3,400 to 5,200 feet. 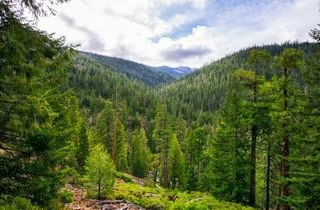 Timber Products Company is planning a tractor and cable shelterwood logging operation in Jeffrey pine, ponderosa pine, Douglas fir, sugar pine, incense cedar and white fir stands. The THP area drains from Picayume Creek towards Trinity Lake and contains some loose granitic, ultramafic and serpentine soils which are prone to erosion. There are 2 unstable areas; including a transitional/rotational landslide above unit #3 - west of unit #4, and a debris flow channel with a small head scarp that occurs within unit #3. Timber Products Company wants to use a tractor as a guyline on a road with a cut bank failure and a debris flow above a cable yarder operation, and to use the outside edge of an existing landing inside a class II watercourse. 312 acres of Alternative Prescription are proposed to remove trees over 23” dbh, and to selectively remove diseased, dying or slowly growing trees in the understory. This THP is just SW of Timber Products Company’s new (Slide Lake THP) THP 2-13-070 TRI. More information is available on the THP Tracking Center website.